Do you know exactly how secure your wireless network is? But if there is no lock, it means your wireless network is wide open, and anybody who is within range can piggyback on your network. And that can mean all sorts of trouble for you. • Security of your data: Anybody who is savvy enough to glom on to your network probably can figure out how to get to your data. It’s easy enough to imagine the bad things that could happen if your personal and professional data was compromised. • Speed of your network: Even if the kid next door is doing no more harm than simply using your network to stream movies or download entire Dave Matthews Band concerts, all that traffic will slow your online speed down to a crawl. That means your download speed will be diminished, something you certainly don’t want. • Legal reasons: If somebody is using your wireless network to download copyrighted or illegal material, or uses your IP address to post defamatory and/or threatening posts online, whose door do you think the authorities will knock on first? 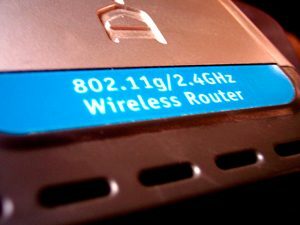 Adding security to your wireless router is simple – how you do it depends on what brand you have. To configure using an Apple wireless product (AirPort Extreme, Express or Time Capsule), you will need to use AirPort Utility (included on every Mac, found in the UTILITIES folder (which is inside the APPLICATIONS folder). Virtually every other brand of router is configured using a standard Web browser – Safari, Firefox or Google Chrome. You must enter the IP address of the router (which can be found in SYSTEM PREFERENCES>NETWORK) in the URL bar of your browser. Every model is different, but if you look for “Settings” or “Wireless,” you’ll be on the right track. Click here for my piece on wireless security, rated “Great Answer” from AnswerBag.com.